Songs of Eretz Poetry Review is pleased to present “Lobsters and Fish” by Neil Ellman. Mr. Ellman has more than 1,000 poems in journals throughout the world. He has been nominated twice for a Pushcart, twice for Best of the Net, and once for a Rhysling Award. 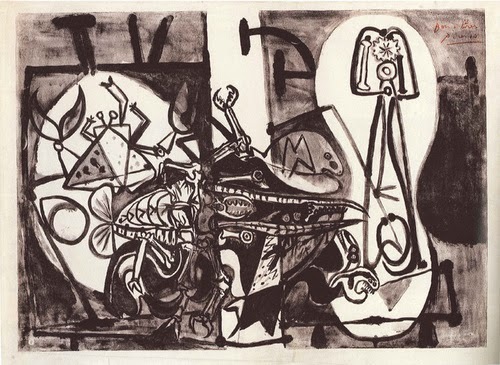 Poet’s Notes: Pablo Picasso's lithograph, "Lobsters and Fish," is a somewhat abstracted picture of lobsters and fish. It makes no political statement, nor does it attempt to impose any particular philosophy or ethos on the subject matter. As such, it is an excellent prompt for an ekphrastic poem, allowing the poet almost free reign. When I first saw the lithograph, my response was quick as I remembered how some people were repulsed when they learned that I actually boiled live lobsters, and my response to my own response was that I imagined the acquiescence of the lobsters themselves, and how that reflected our own acceptance of the inevitable. Editor’s Note: Any connection between the poem and the litho aside, I find “Lobsters and Fish” is strong enough on its own, playful and fun.